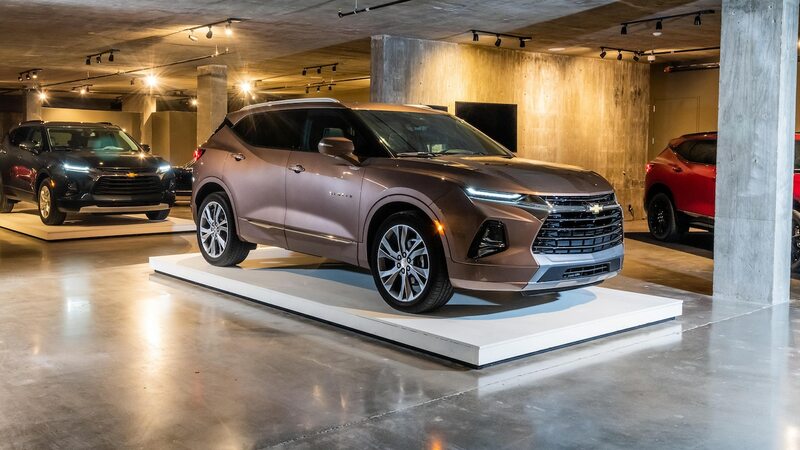 Home » Cars » Chevrolet » Blazer » 2019 Chevrolet Blazer First Drive: Style. 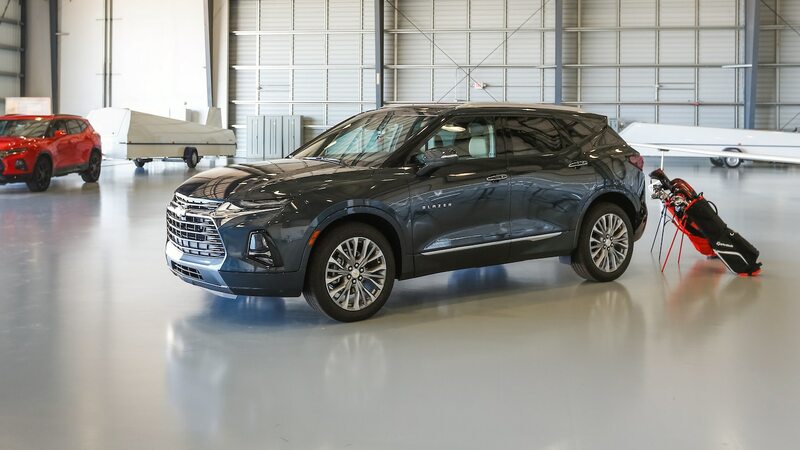 Substance? 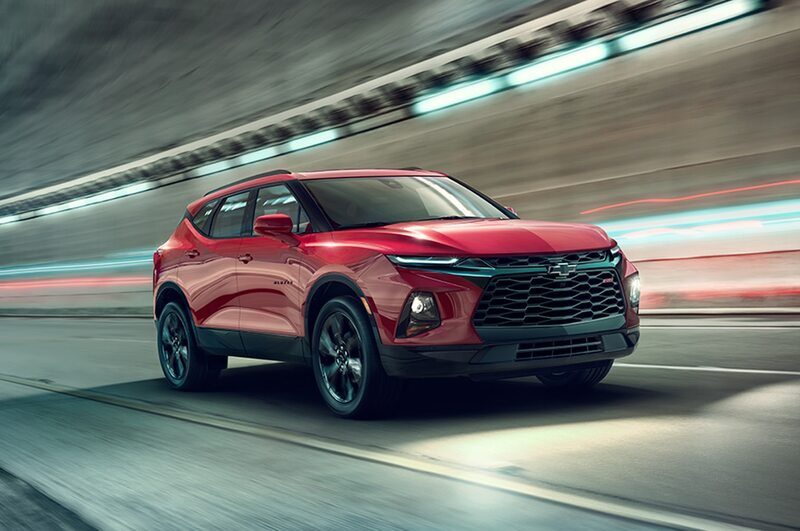 More boulevard cruiser than backcountry off-roader, the Blazer returns to relevance as the style star of Chevrolet’s SUV/crossover lineup. 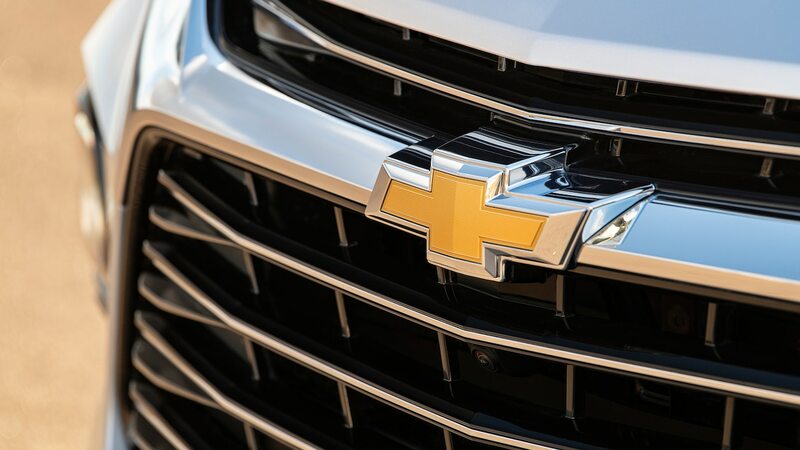 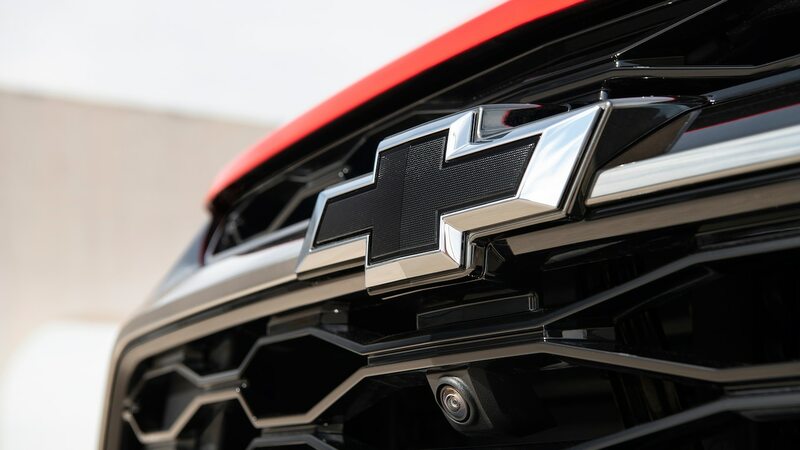 Purists may insist that the iconic Blazer badge should only be applied to a traditional SUV and not a crossover, but they’ll be trampled by consumers happy that Chevy finally competes head on with the Ford Edge, Nissan Murano, and Jeep Grand Cherokee. 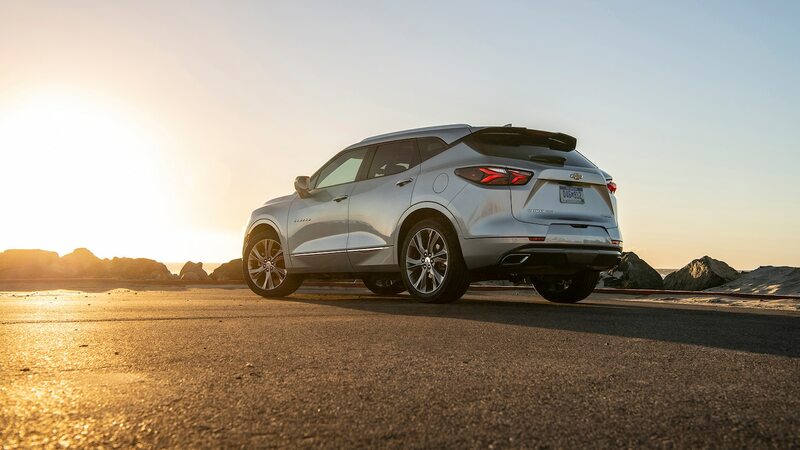 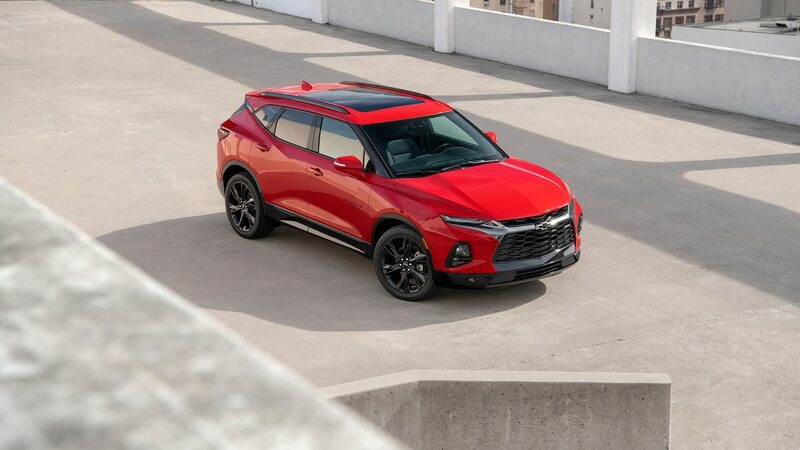 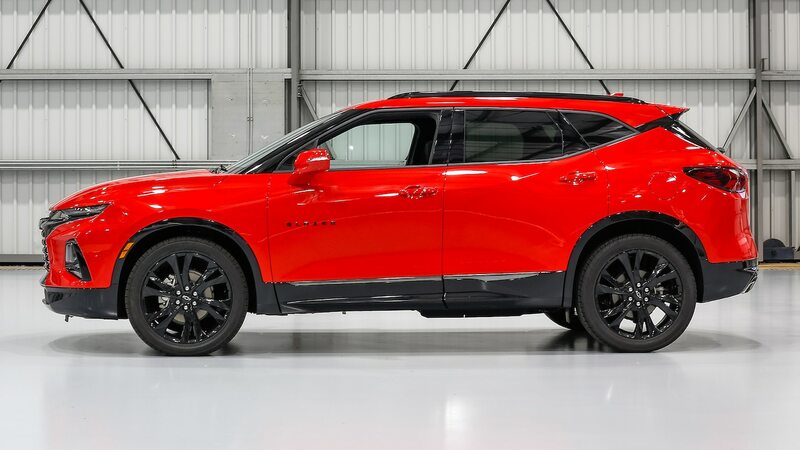 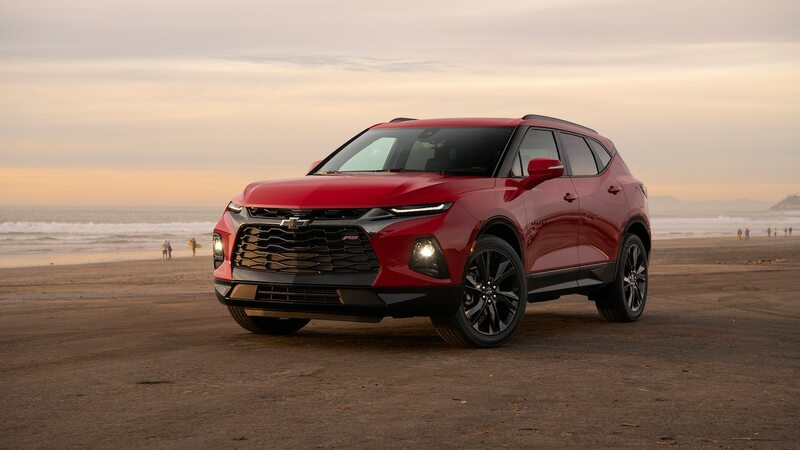 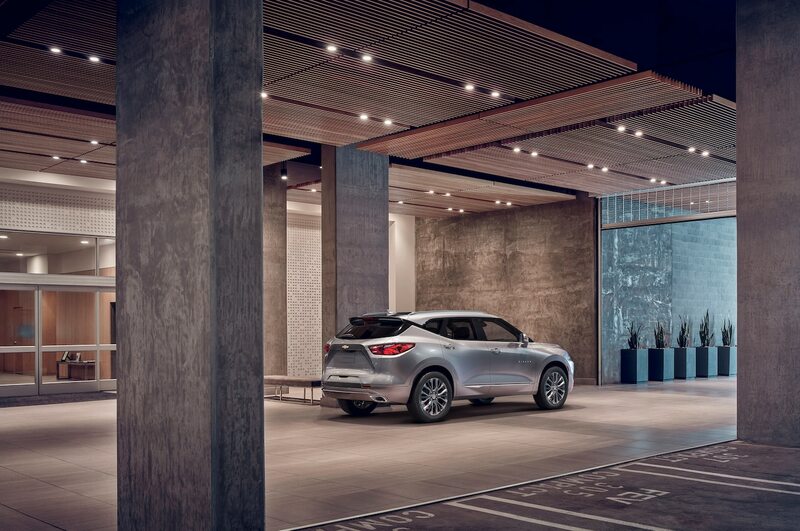 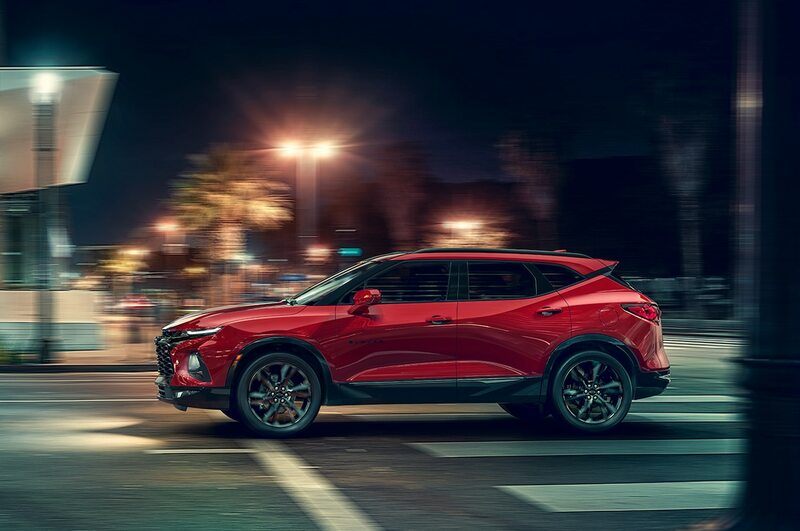 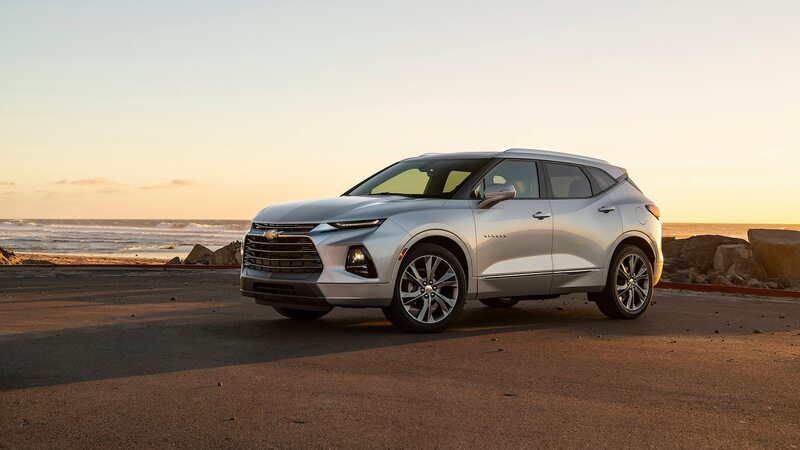 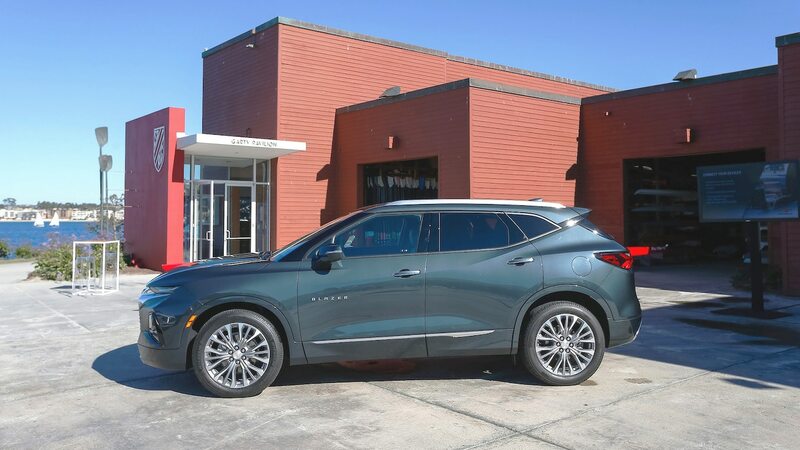 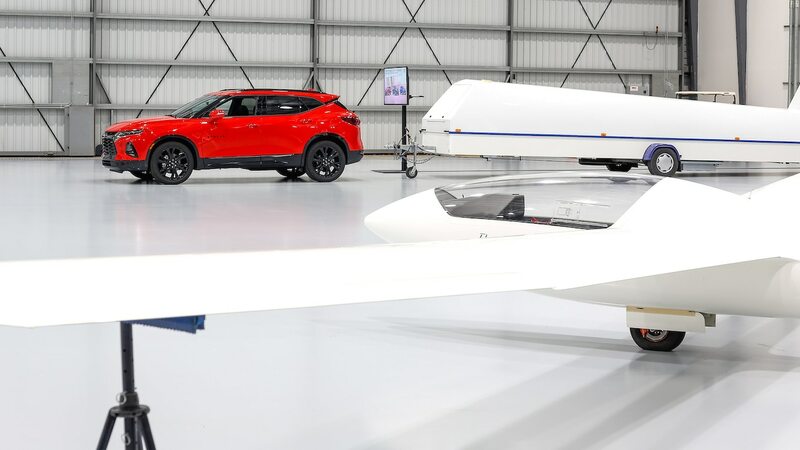 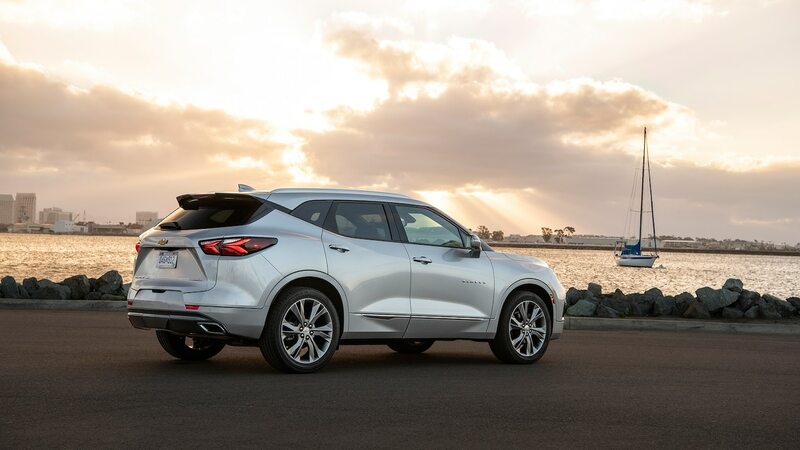 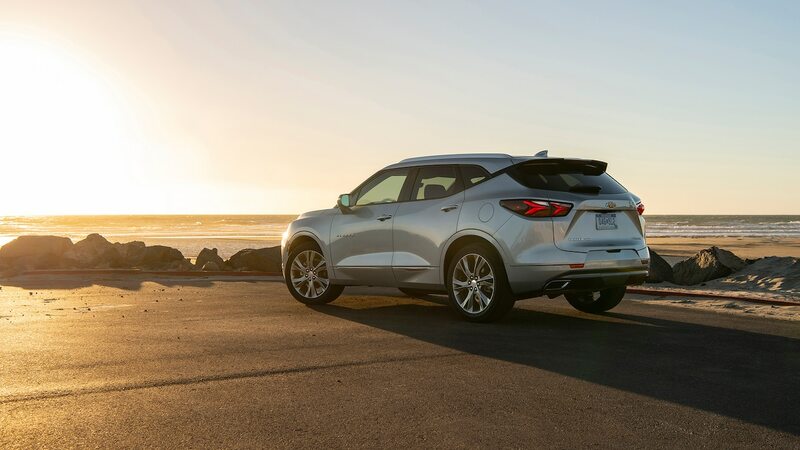 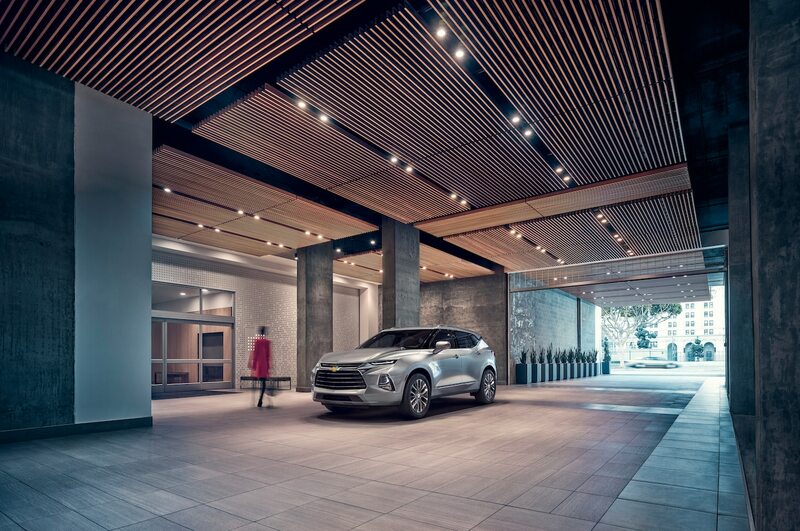 Compared to those rivals, the 2019 Chevrolet Blazer offers a unique design—that much is clear. 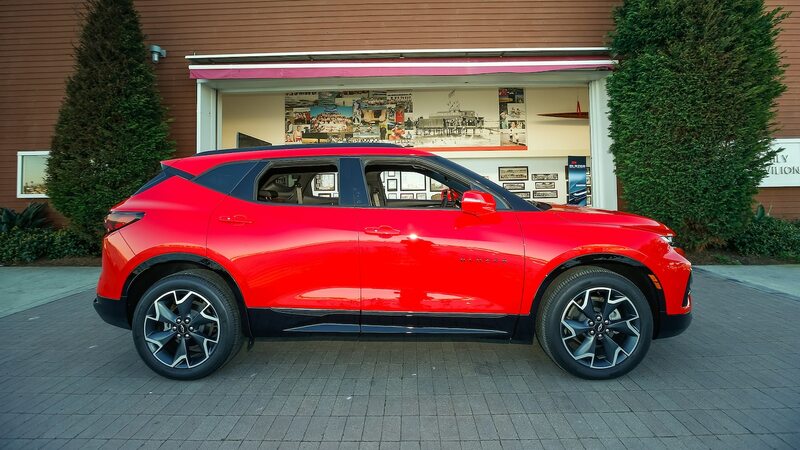 But how much substance backs up the 2019 Blazer’s style? 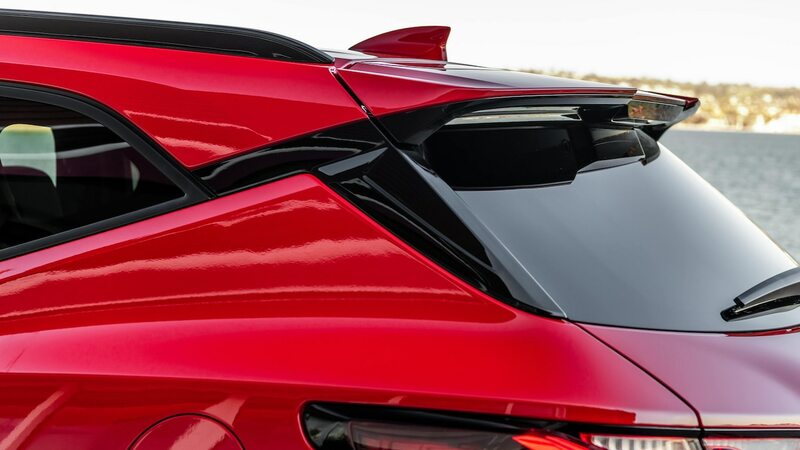 We drove the new two-row model to find out. 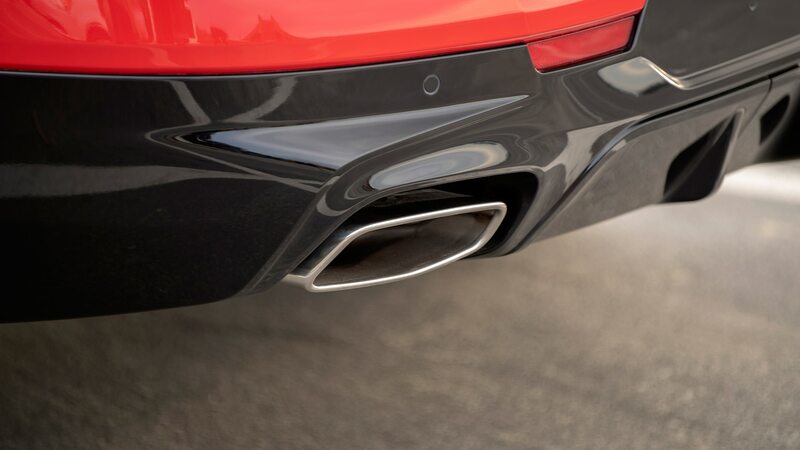 The RS’ exhaust doesn’t sound any different from other models, nor do its seats feel appreciably different, but there are visual upgrades and the steering is quicker. 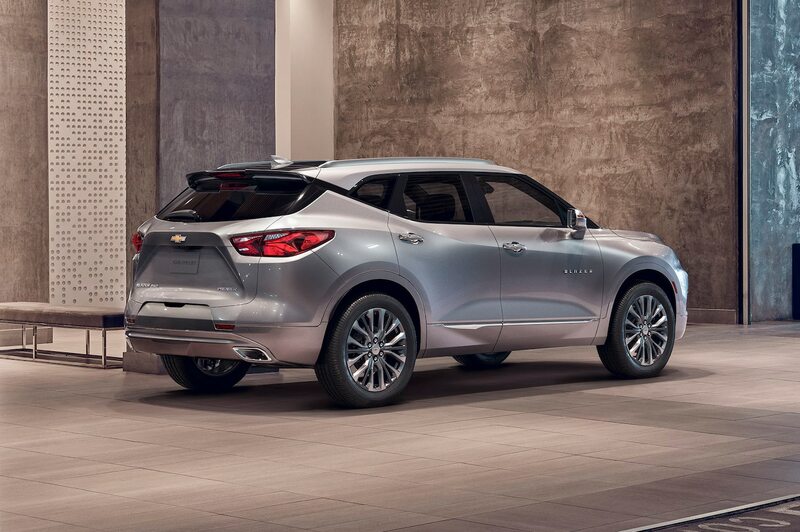 Don’t think of the Blazer as an Equinox-plus. 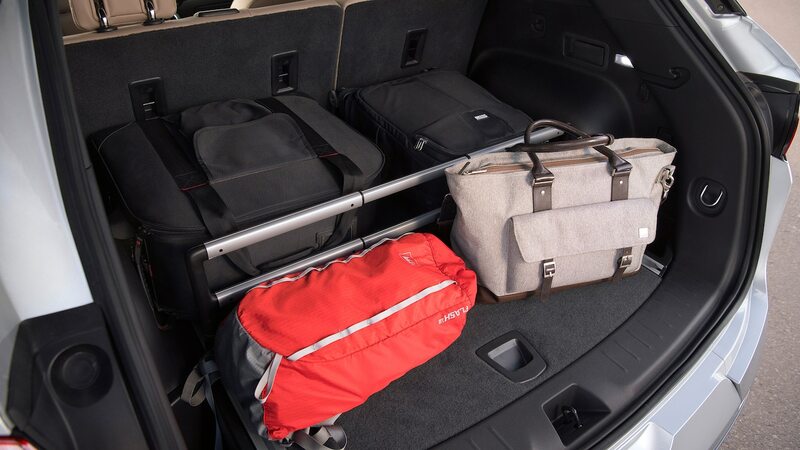 If you want maximum cargo space from a midsize crossover, the Honda Passport obliterates the Blazer with 41.2 cubic feet of cargo space with the seats in place to the Chevrolet’s 30.5. 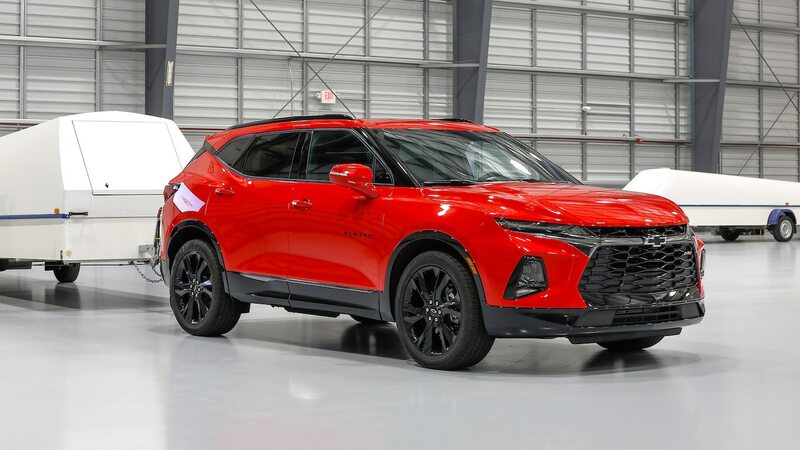 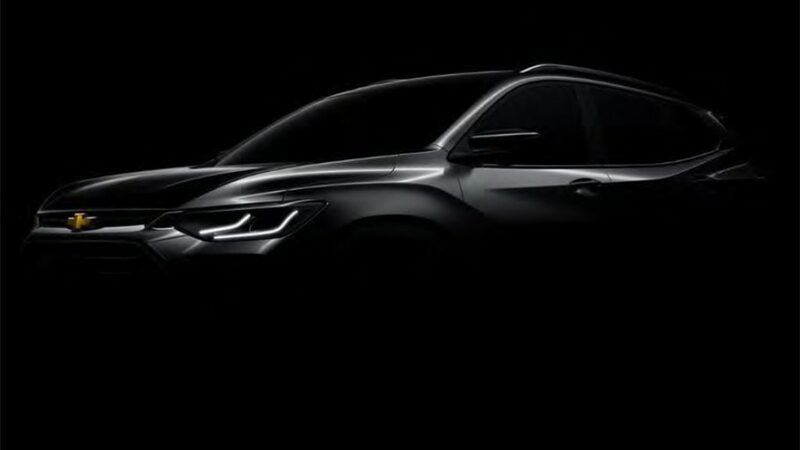 At least with the Chevrolet, however, no one will ever accuse the Blazer of resembling another SUV (the Passport looks a little like the three-row Pilot). 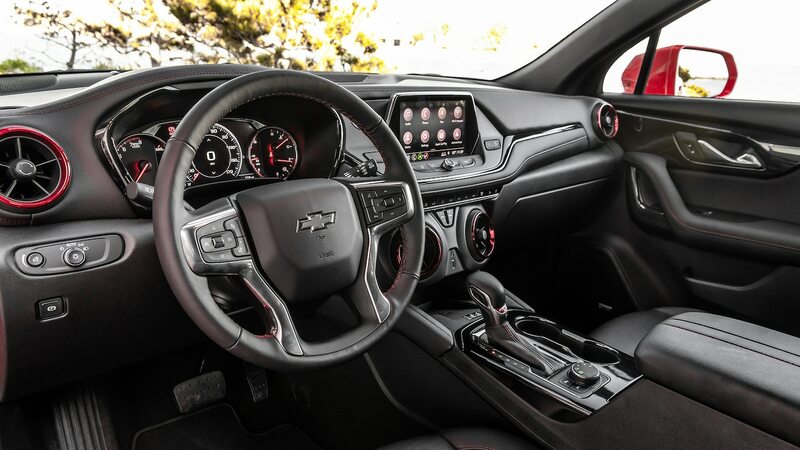 Plus, Chevrolet nails other important interior details. 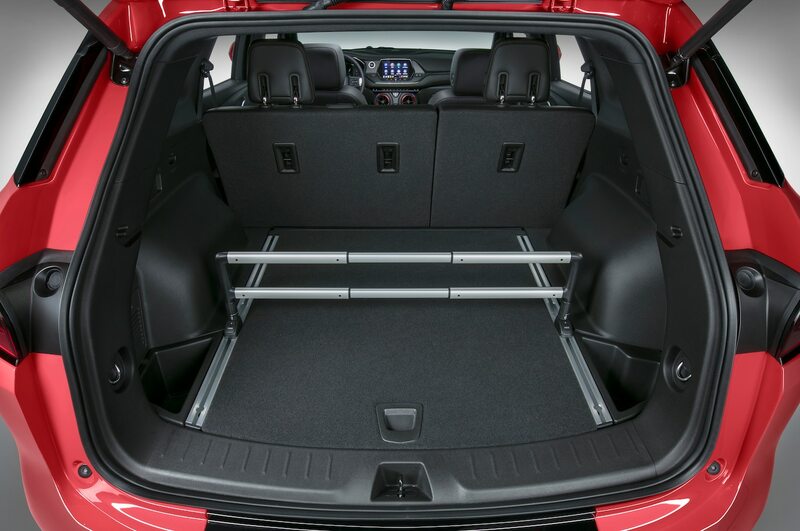 Fitting three passengers in the spacious rear seat for a trip across town is facilitated by the nearly flat floor, though headroom is a bit tight with the panoramic sunroof. 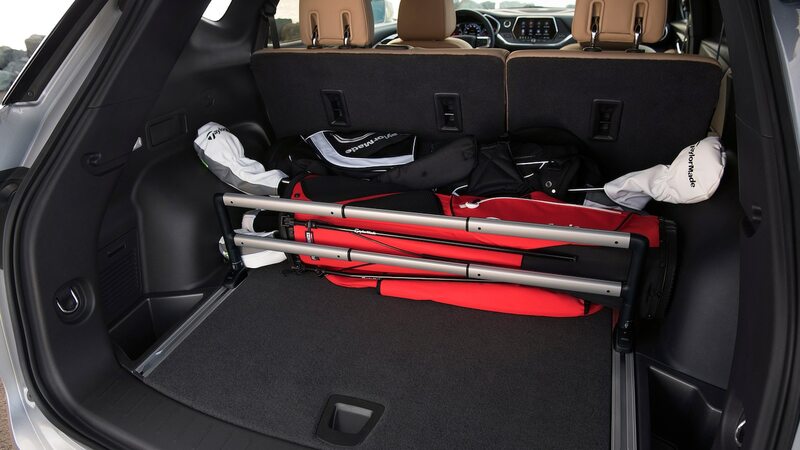 The large backrest recline lever—smartly located below the rear passenger’s thigh for easier access—is a helpful touch. 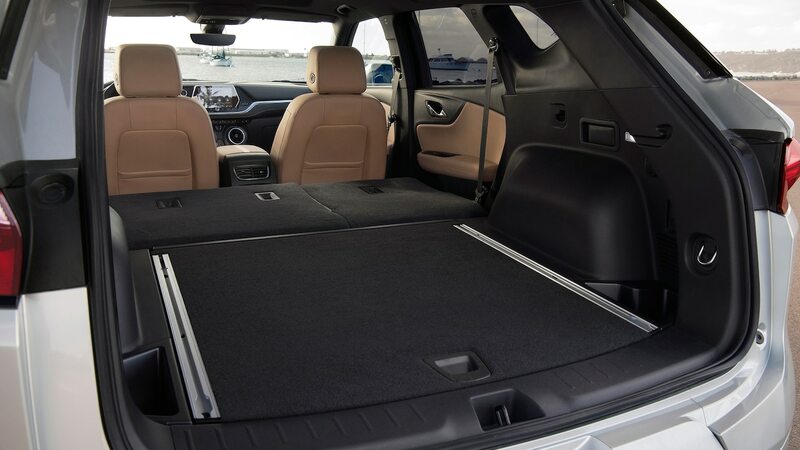 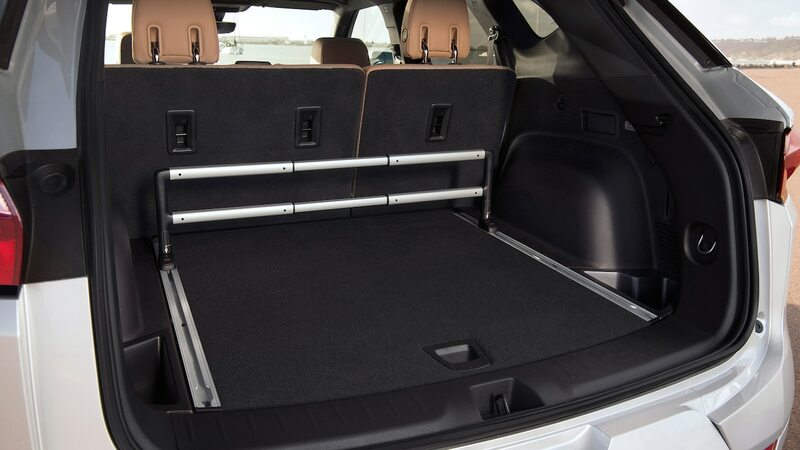 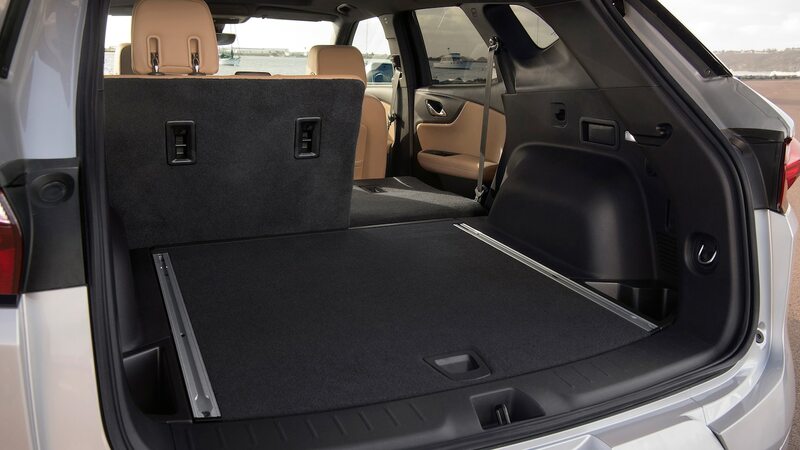 The same goes for the space underneath the front seats for rear passengers’ feet, and the two levers that fold down the rear seats flat from the cargo area. 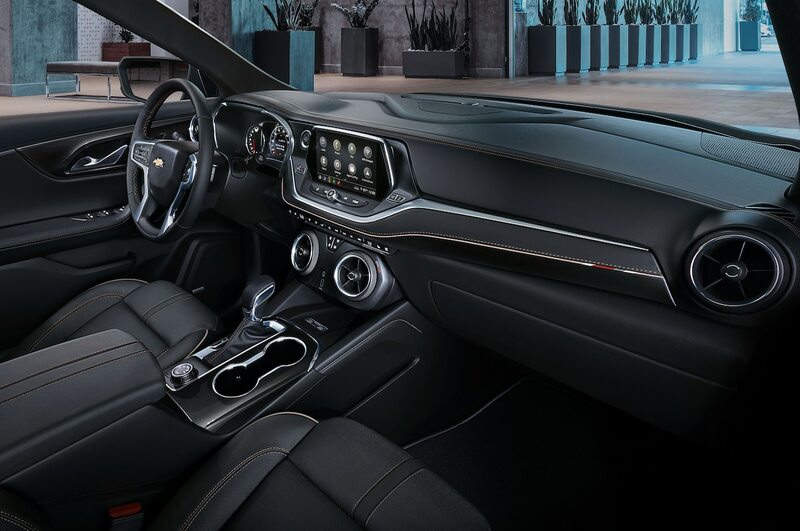 A Camaro-inspired center stack livens up the interior design, but—surprise, surprise—the Blazer doesn’t drive like a sports car. 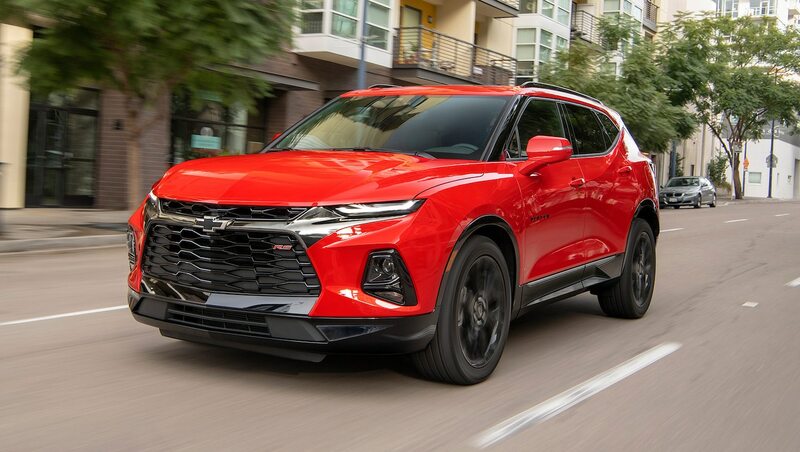 Even so, the 3,800-to-4,300-pound (1,724-to-1,950-kg) crossover moves confidently, whether you’re in a four-cylinder front-driver or a loaded RS AWD V-6. 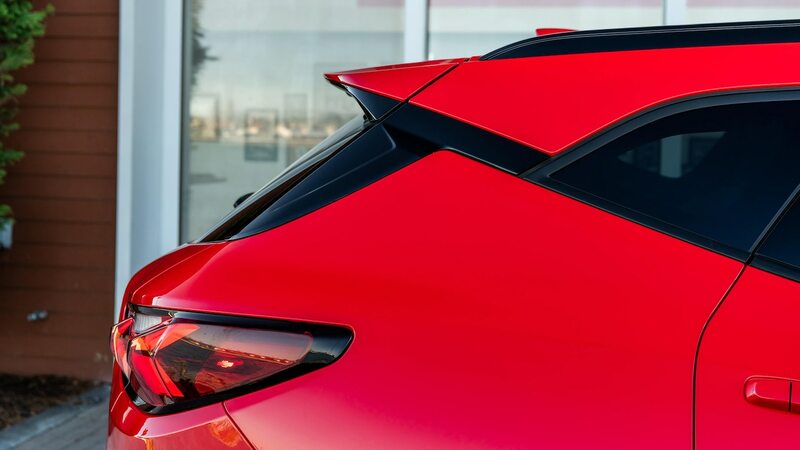 The 193-hp 2.5-liter naturally aspirated I-4 actually feels plenty powerful in town. 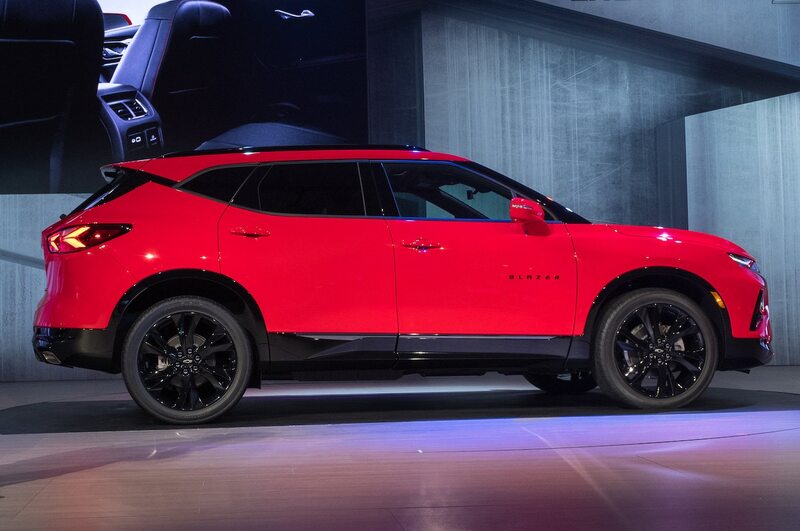 It’s only when you enter a freeway onramp or attempt a pass that you’ll miss the pricier V-6. 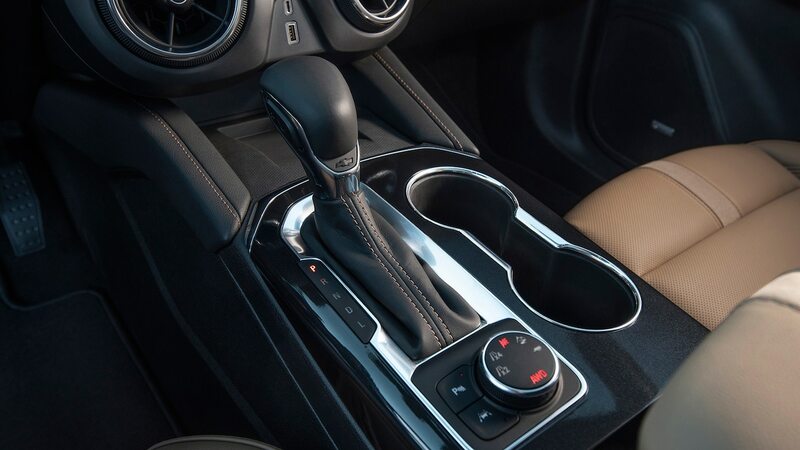 A responsive nine-speed automatic is standard and, except for a rev-hang issue experienced on a four-cylinder tester, the transmission works well with both engines. 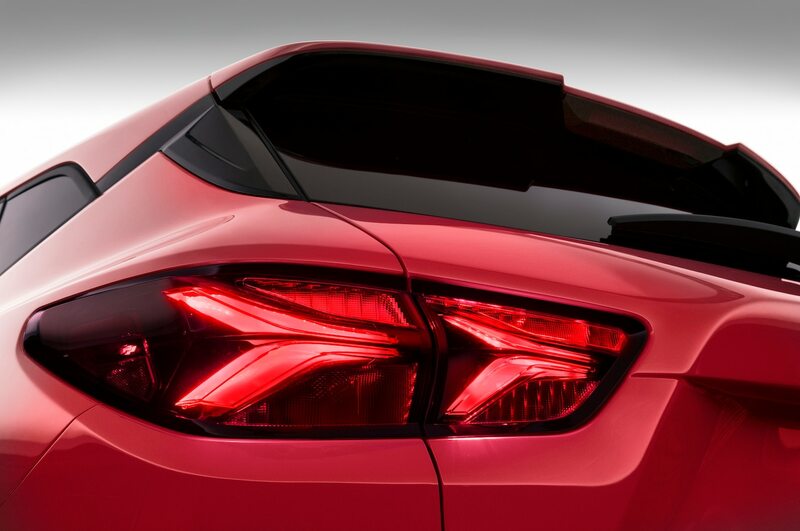 Most buyers will choose the 308-hp 3.6-liter naturally aspirated V-6, which is your only option if you want all-wheel drive. 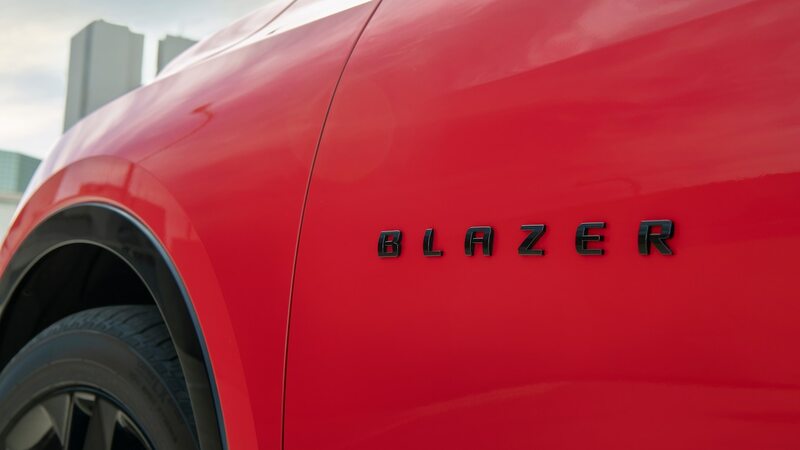 Regardless of drivetrain, pick the Blazer RS for a flashier look and sportier drive. 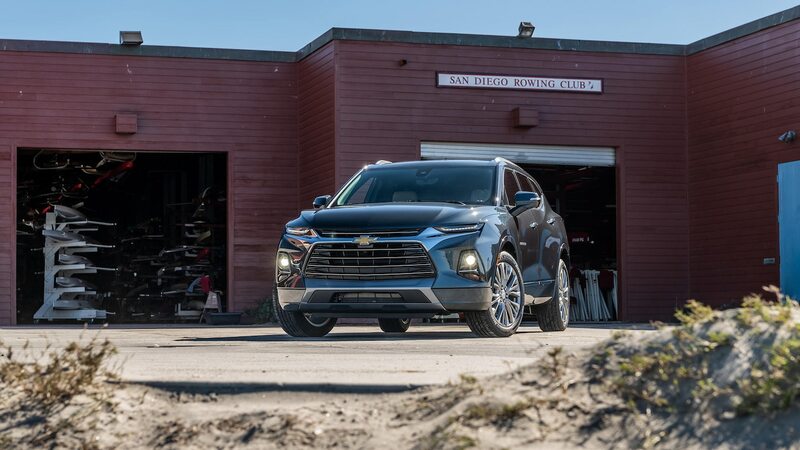 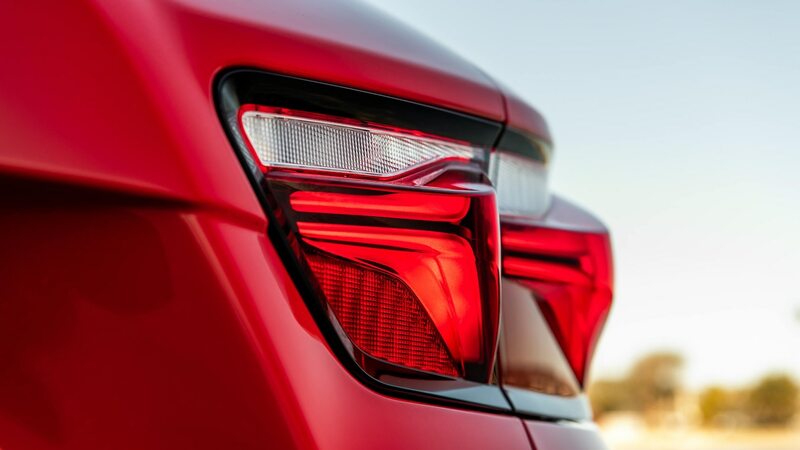 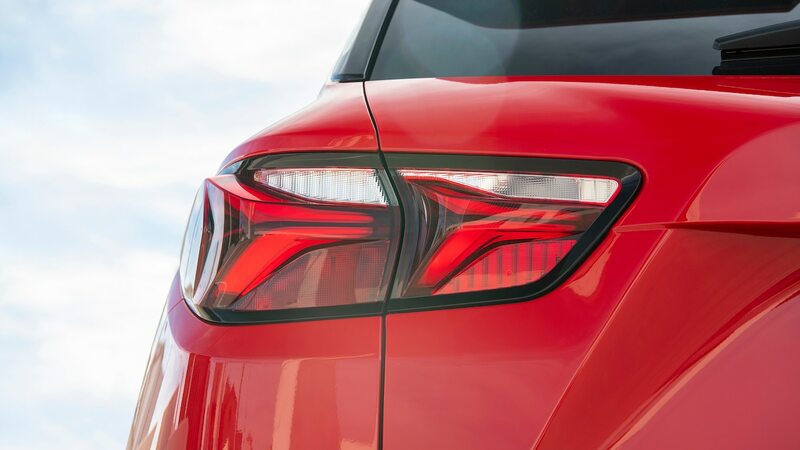 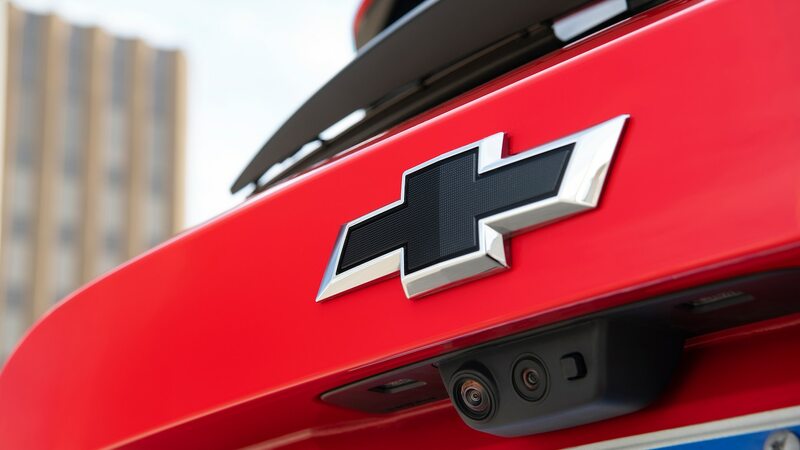 From the front to the rear, Chevrolet appreciably updates the Blazer’s visual details from one trim to another. 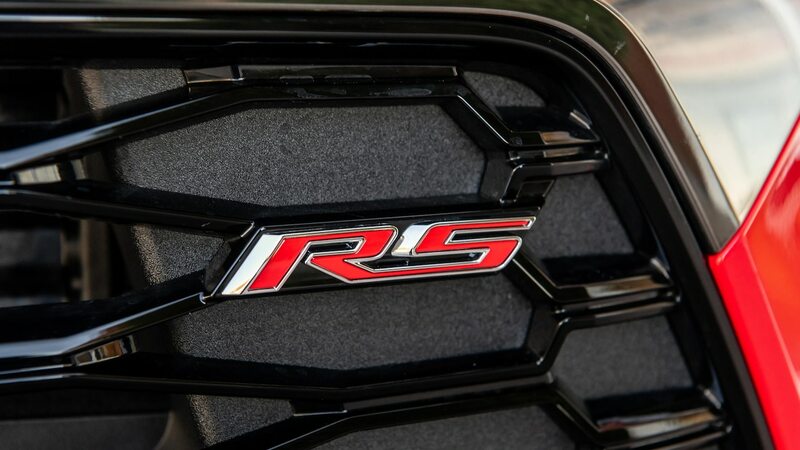 The RS backs up its bolder exterior cues not with more power from the V-6 but with a stiffer suspension and a 15.1:1 steering ratio. 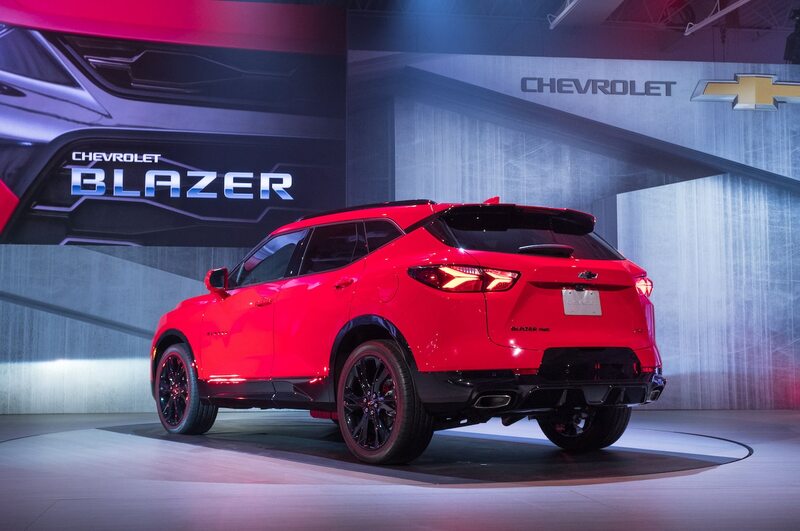 With the latter upgrade, the Blazer RS feels lighter on its feet compared to the 16.1:1 ratio of other Blazers. 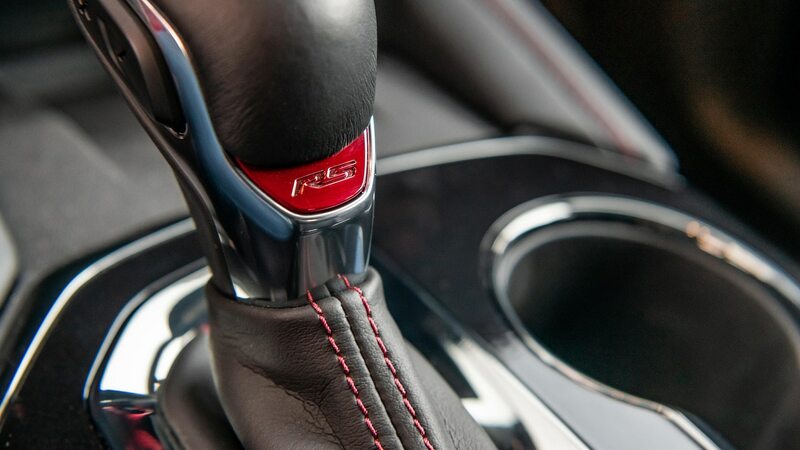 Engaging the sport mode makes the transmission more responsive and gives the steering a weightier feel. 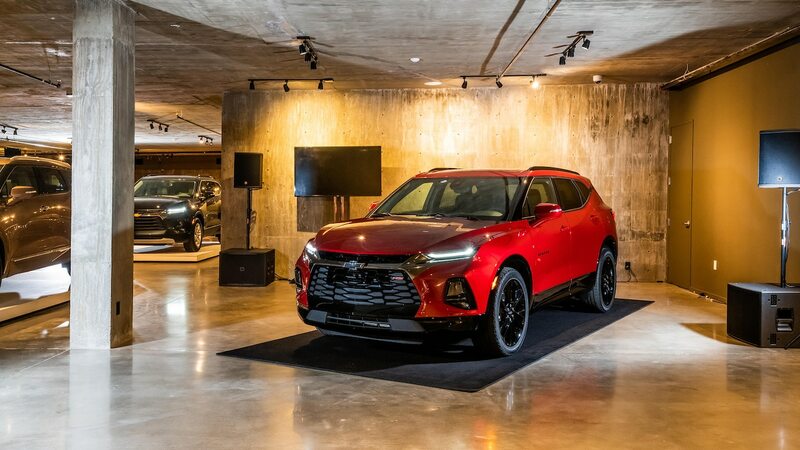 The picture isn’t as bright traveling over less than perfect pavement, where the suspension on the RS with blacked-out 21-inch wheels can prove jarring. 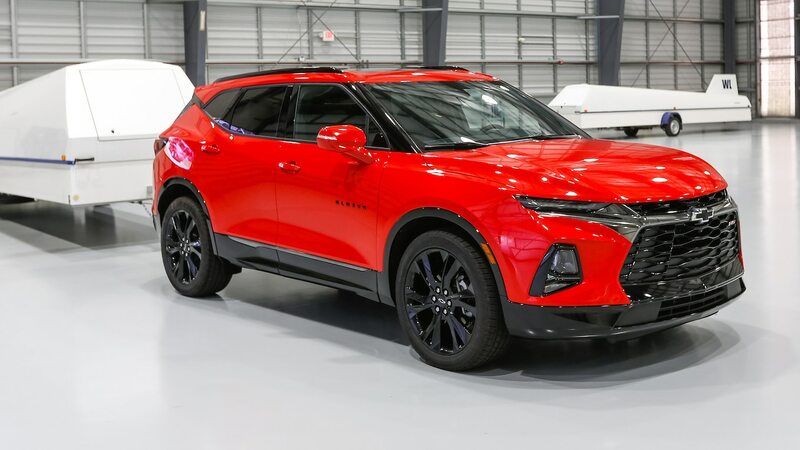 Unless you absolutely must drive the baddest Blazer on the block, consider the RS on its standard 20s and save the $2,495 USD that bundles the 21s with a panoramic sunroof. 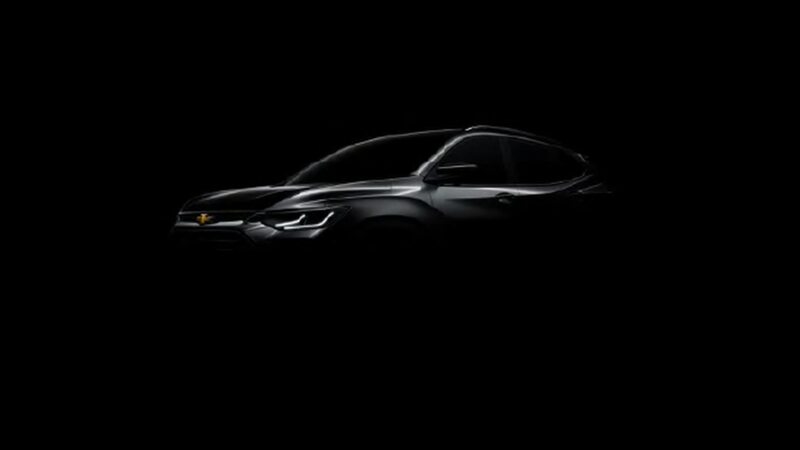 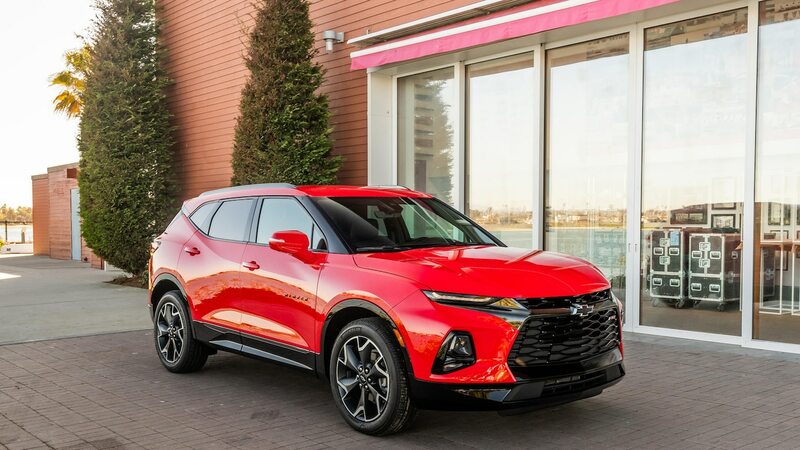 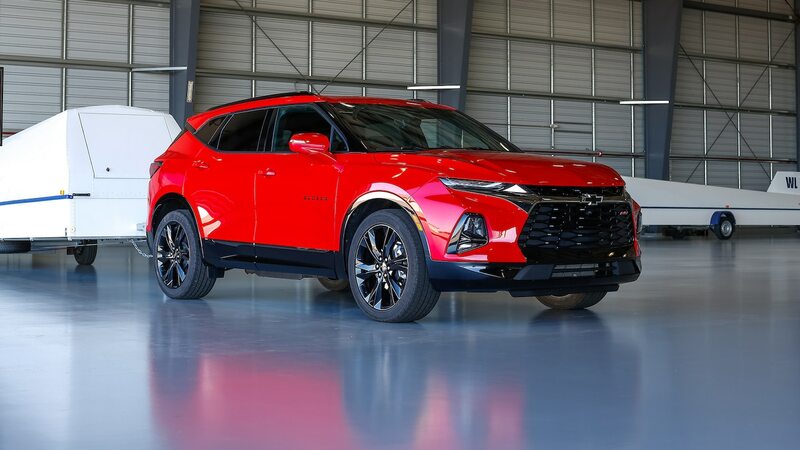 Because unless you’re a Chevrolet loyalist or early adopter, the fact that loaded 2019 Blazer Premier and RS crossovers cross $50,000 USD could catch you by surprise. 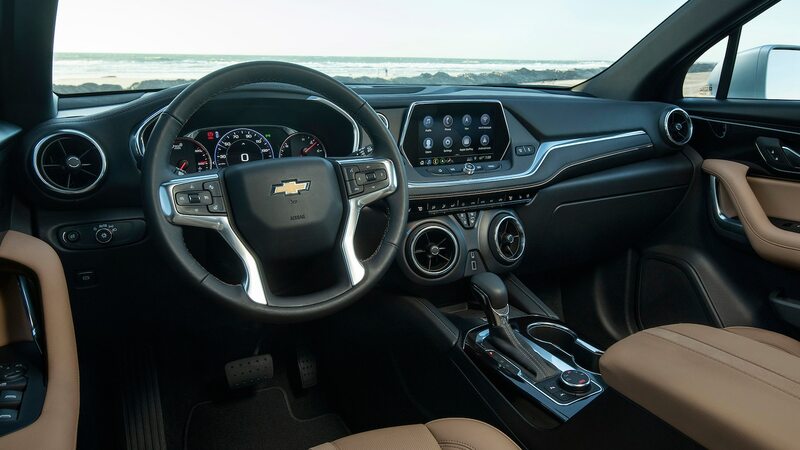 Then again, the Premier’s sueded microfiber interior accents and the power-adjustable steering column might have the same effect. 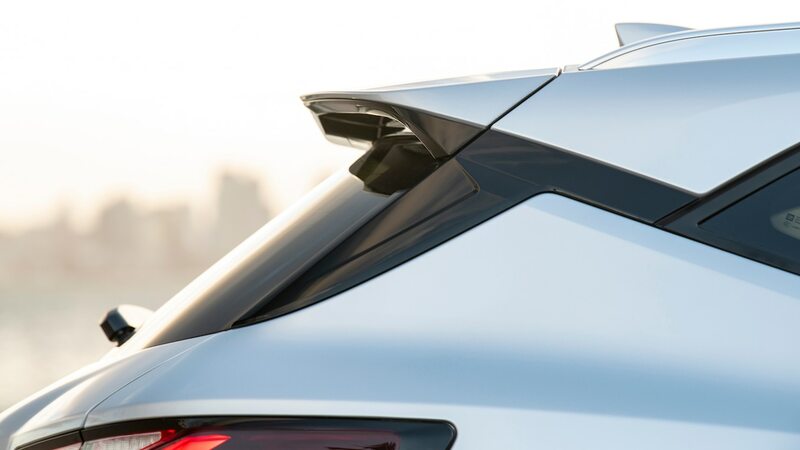 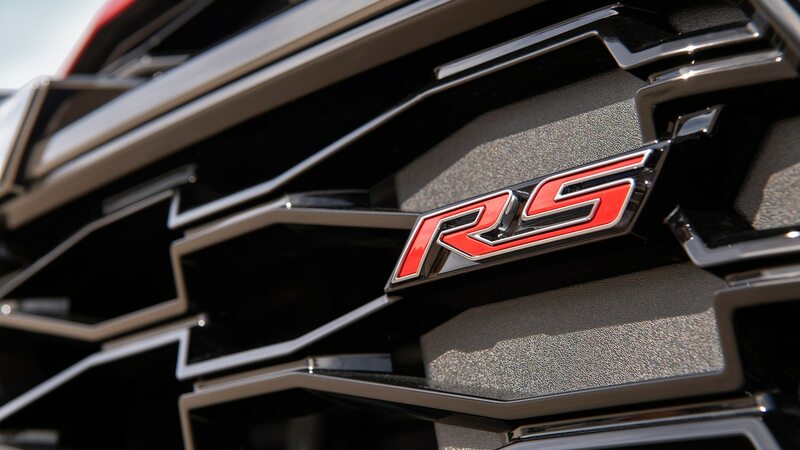 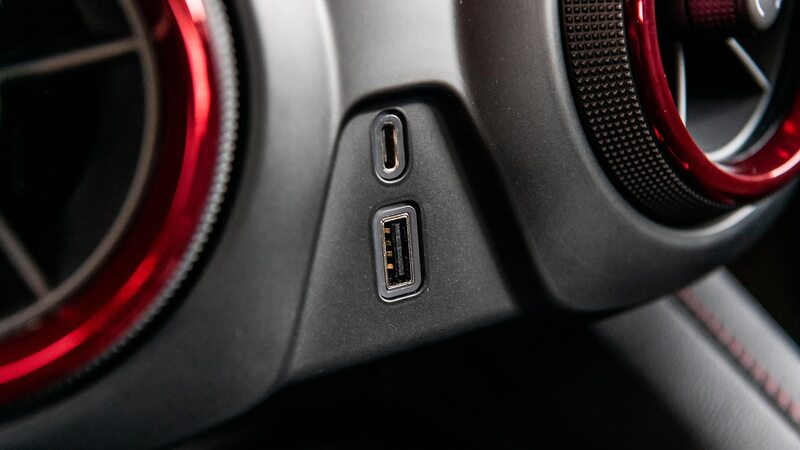 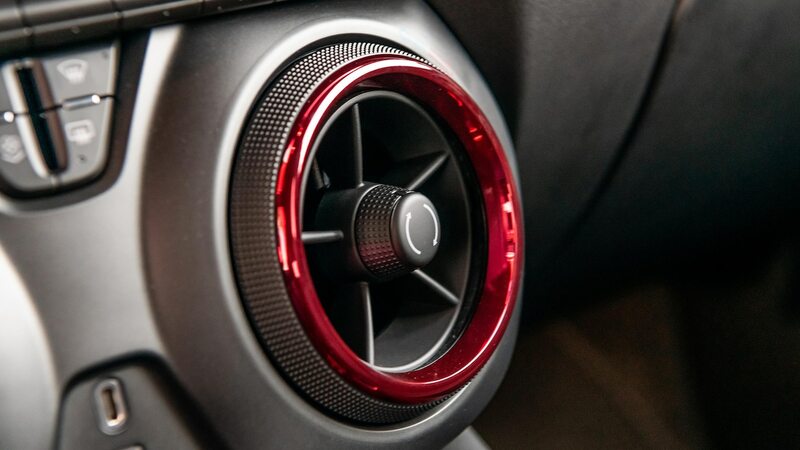 On the RS, design delights include red trim around the Blazer’s enormous front air vents as well as a red RS badge at the base of the transmission stalk. 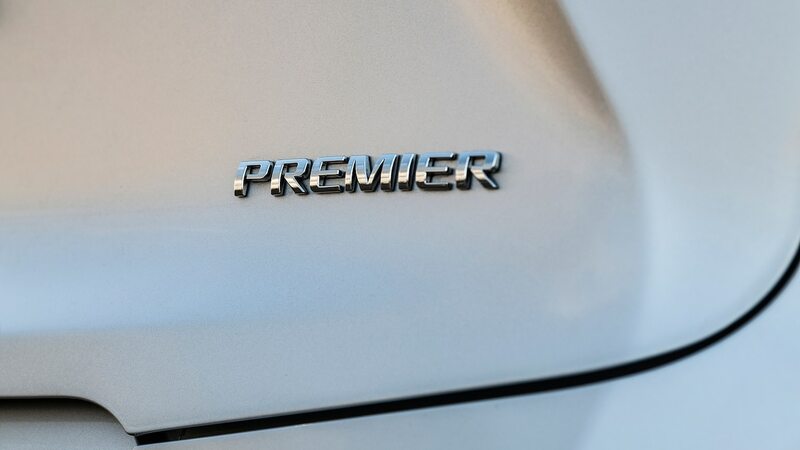 Although the cabin has tons of style—don’t miss the subtle red, white, and blue piping on Premier—we could do with less shiny silver interior trim. 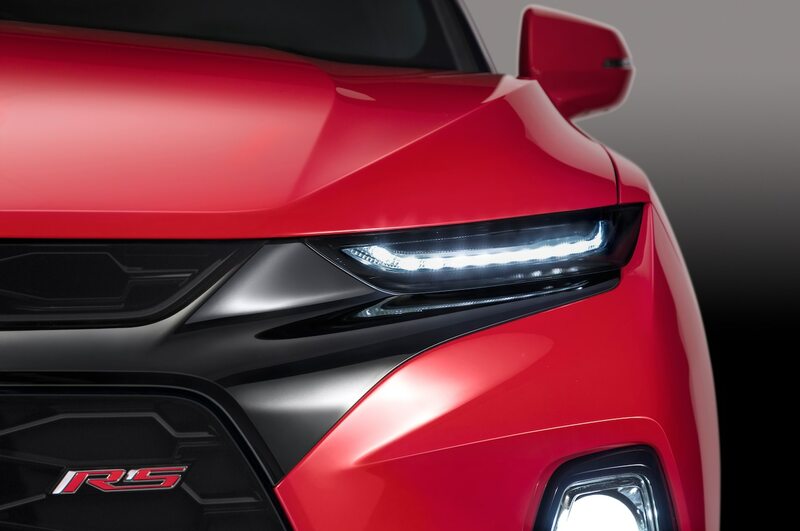 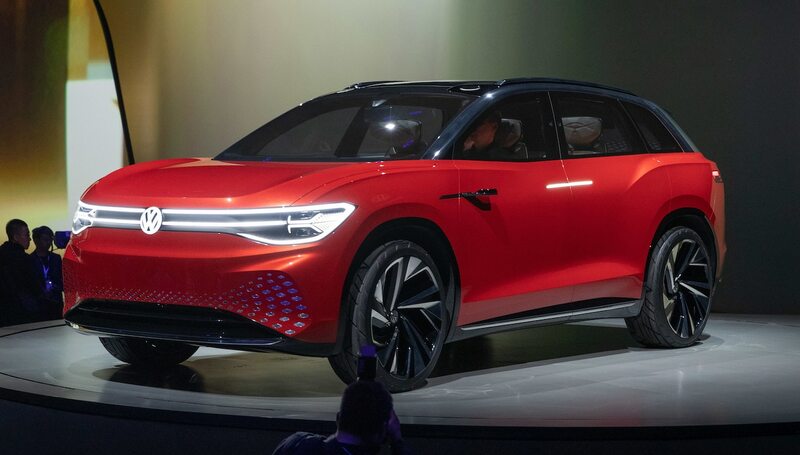 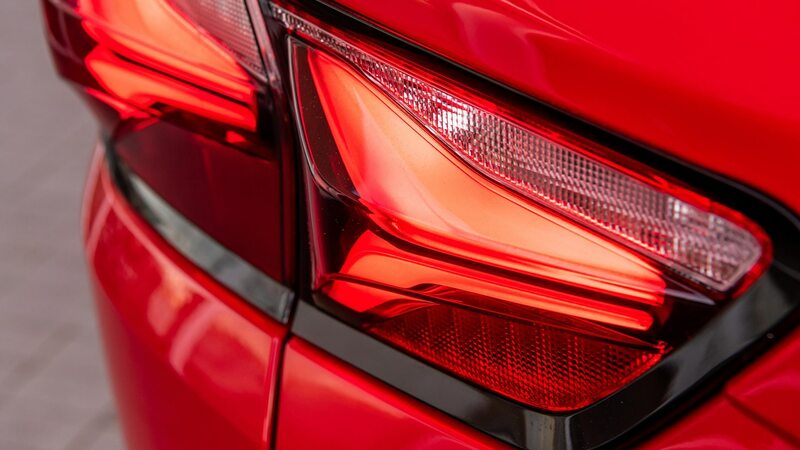 It brightens the dash, center console, and steering wheel of non-RS models (perhaps too much), but we wonder whether some of it will reflect into a driver’s eyes when the sun hits it at just the right angle. 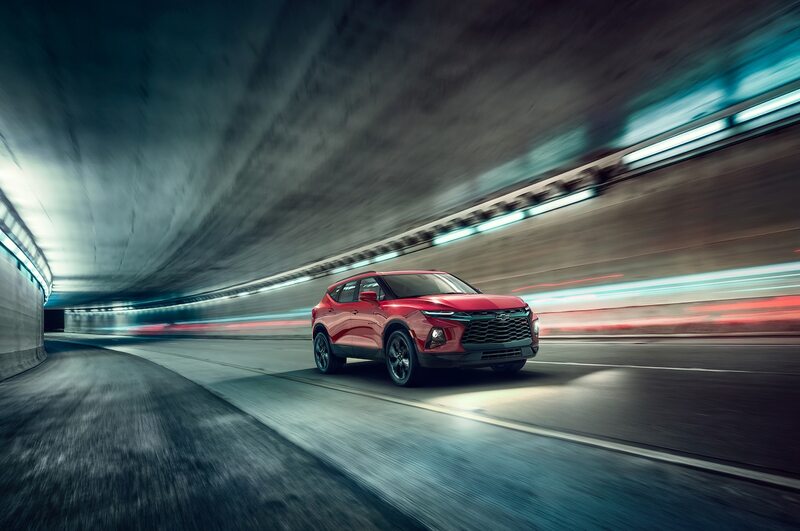 Most potential Blazer buyers won’t bemoan the lack of a head-up display at any price, but we wish an auto brake hold feature was offered. 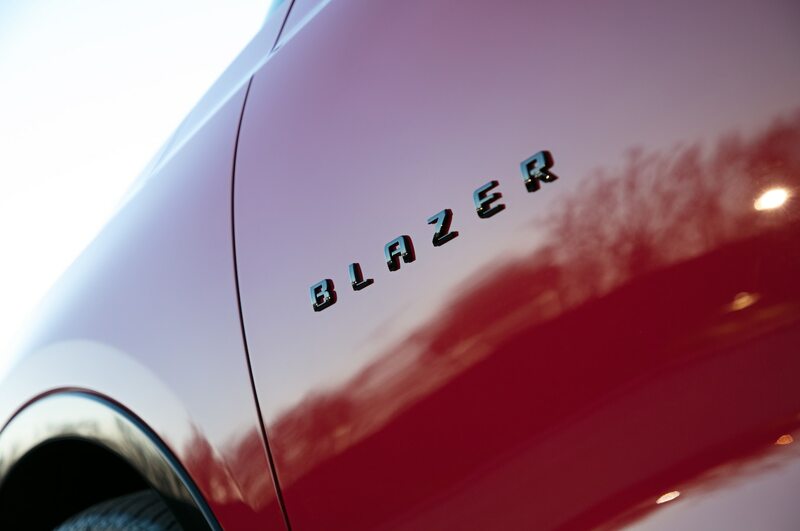 The Blazer’s drive-mode selector could also use a couple tweaks. 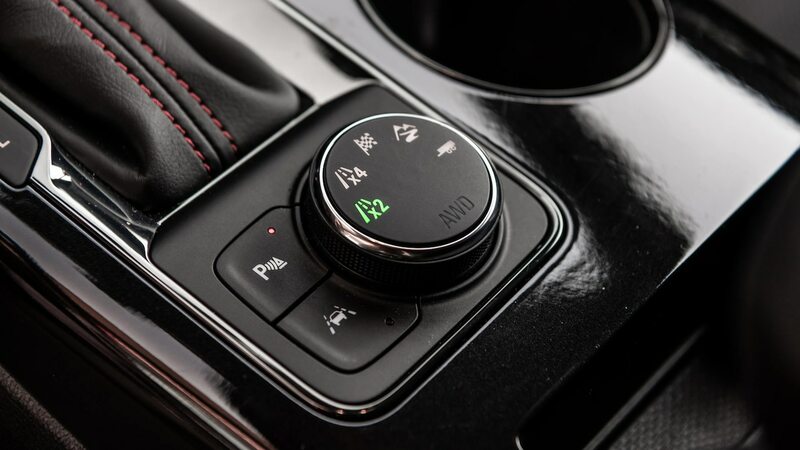 On front-drive models, the rotating knob should place the normal drive mode between the low-traction and sport modes, instead of making drivers turn the dial twice to reach the sport mode. 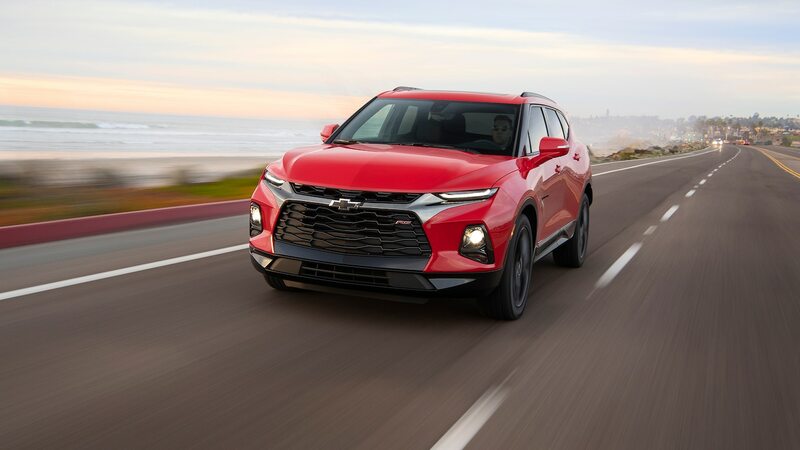 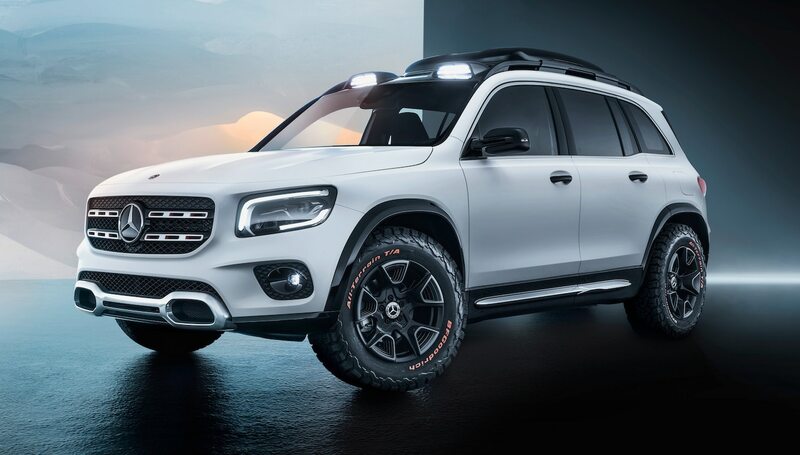 Also, the system has trouble keeping up with quick drive-mode changes if, for example, you want your AWD Blazer to switch from the gas-saving front-drive mode to the sport, off-road, or towing modes a few knob-nudges away. 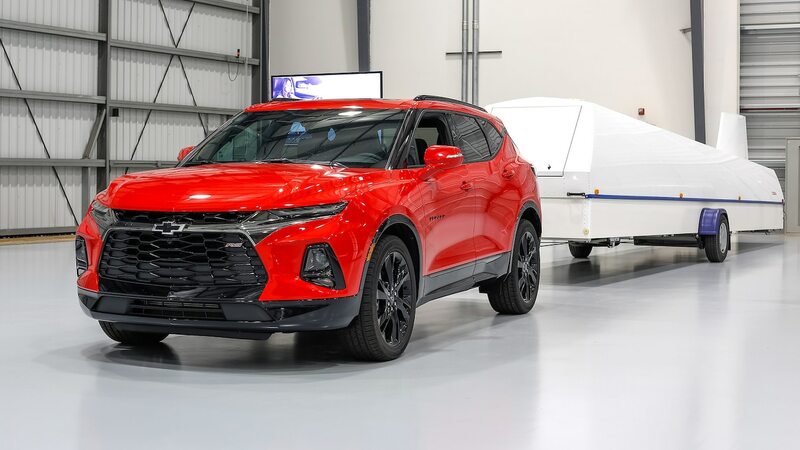 RS and Premier models use a twin-clutch all-wheel-drive system (the lower V-6 trim offers a single-clutch system) that can send torque to either rear wheel, depending on the situation. 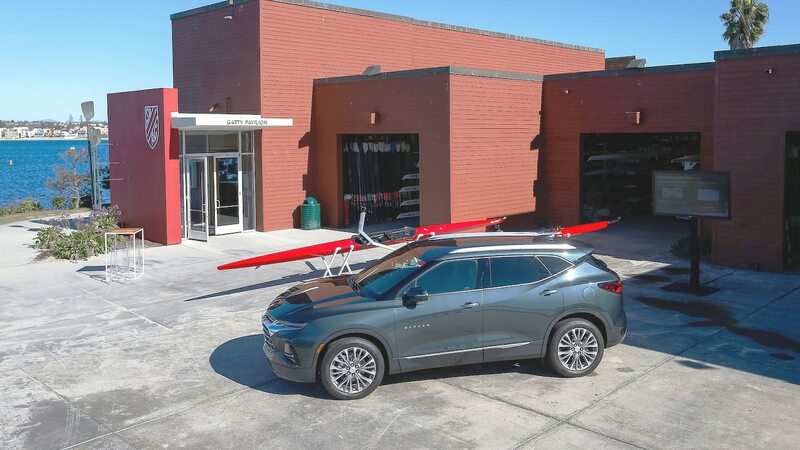 Towing maxes out at 1,500 pounds (680 kg) with front-wheel drive and either engine, or 4,500 pounds (2,041 kg) with the V-6 and all-wheel drive. 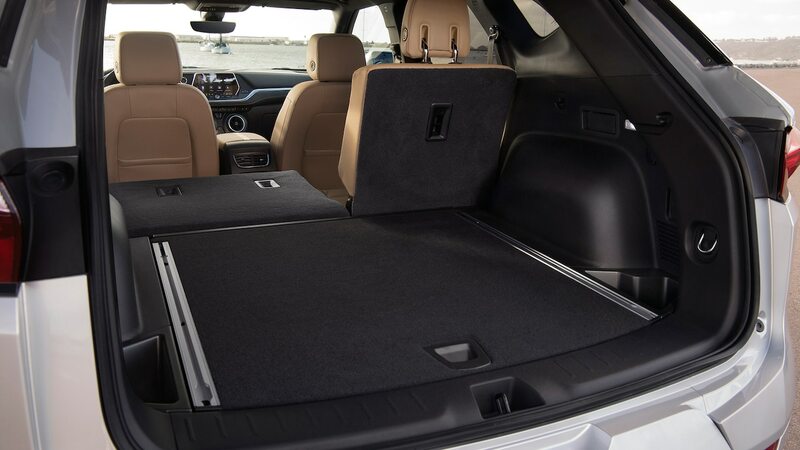 That’s well under the Jeep Grand Cherokee V-6’s 6,200-pound (2,812-kg) capacity but more comparable to the Honda Passport’s 5,000-pound (2,268-kg) maximum. 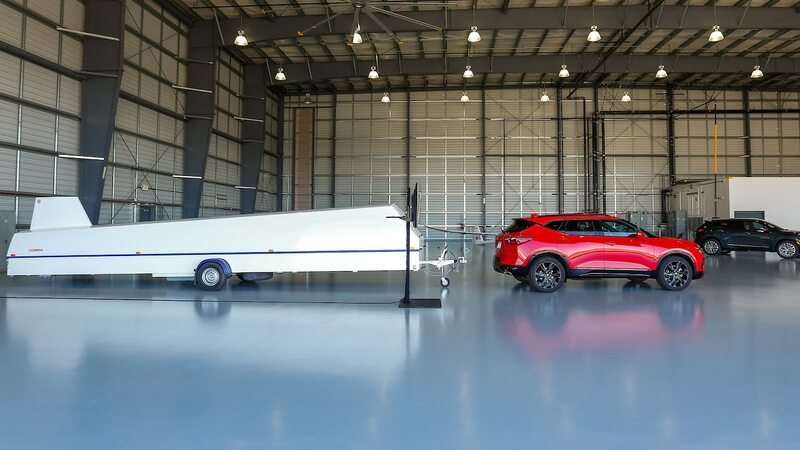 The Hyundai Santa Fe and Ford Edge can tow up to 3,500 pounds (1,587 kg), with the Nissan Murano rated for 1,500 pounds (680 kg). 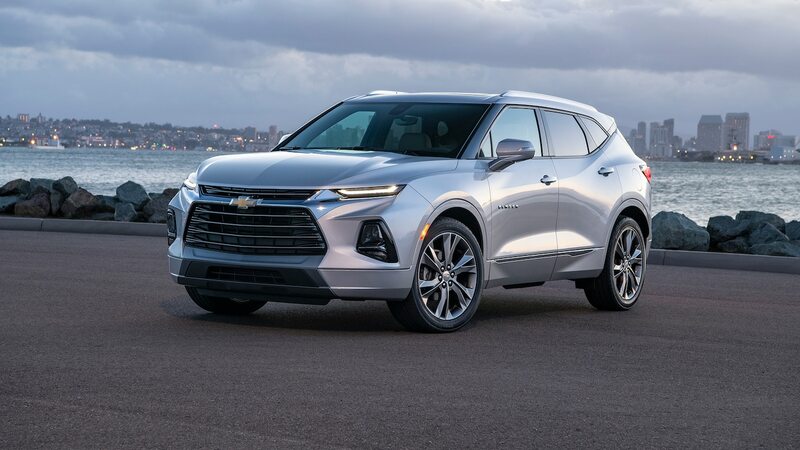 Check out our 2019 Chevrolet Blazer interior review HERE. 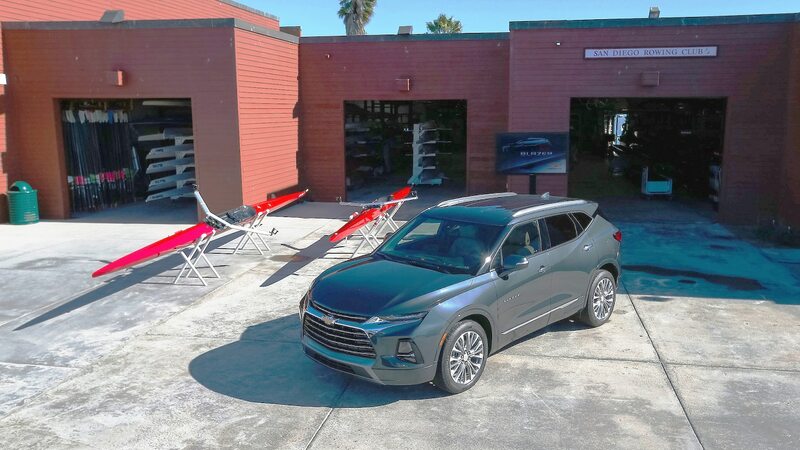 Maybe towing isn’t a priority, or you have a truck for that. 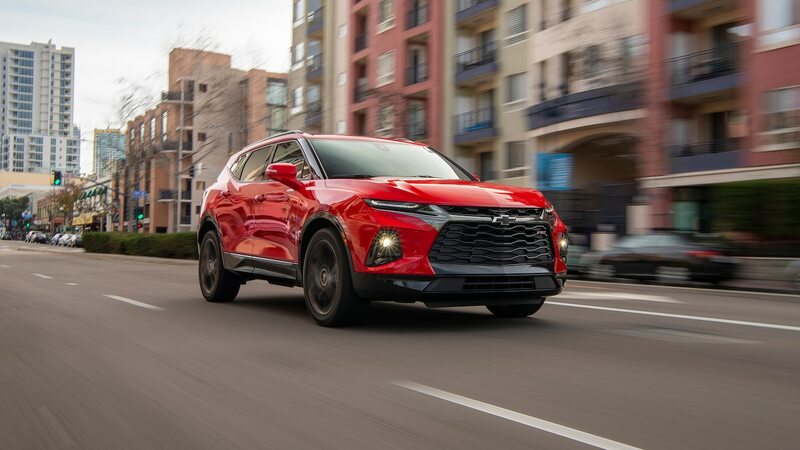 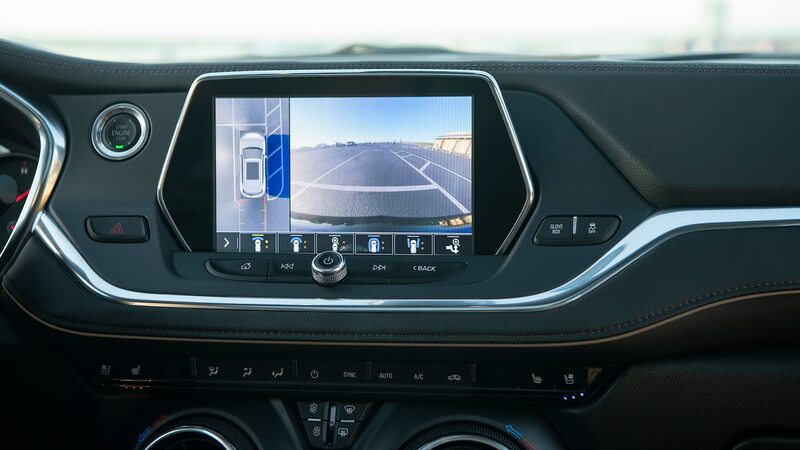 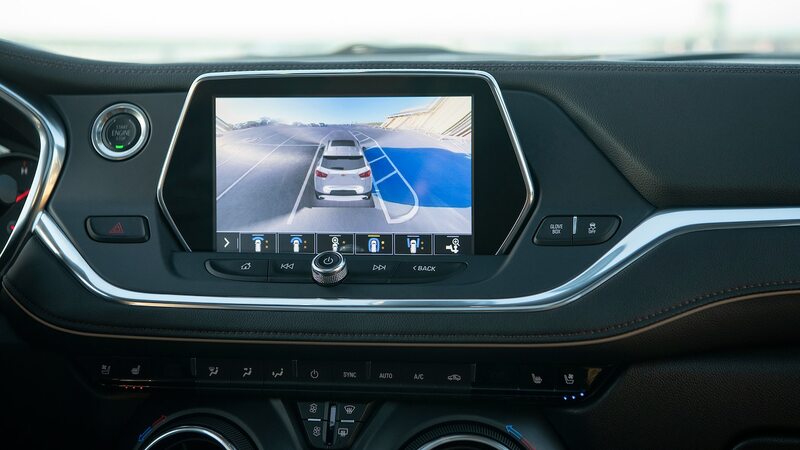 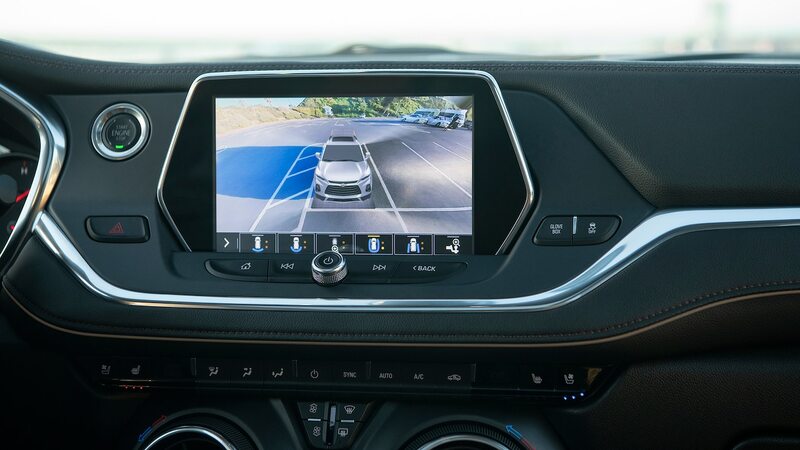 Safety is probably important to you, and to that end, the 2019 Blazer offers rear cross-traffic alert, lane keeping assist, blind-spot monitoring, and automatic emergency braking. 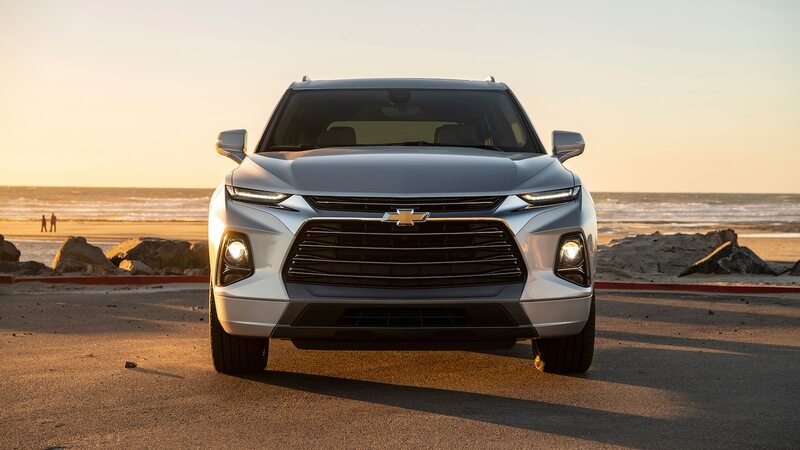 That last feature can save your Blazer’s angry front grille from damage if you’re distracted, yet the feature isn’t available on any Blazer under $45,000 USD. 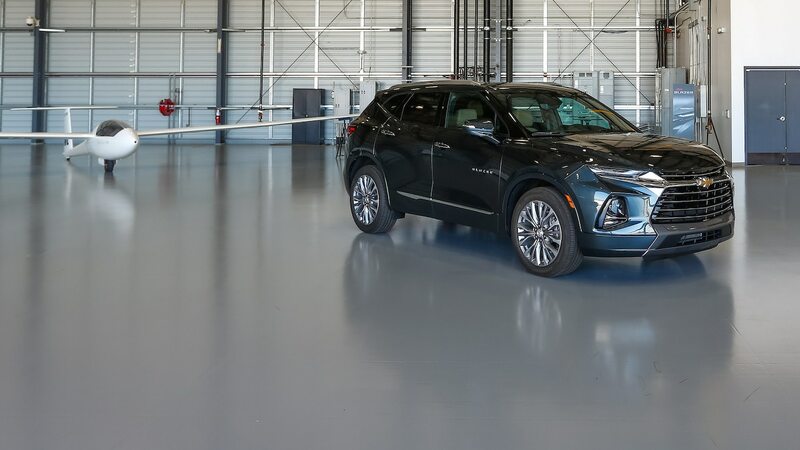 Elsewhere in this class, a version of automatic emergency braking is standard on the competition from Ford, Nissan, Hyundai, and Honda. 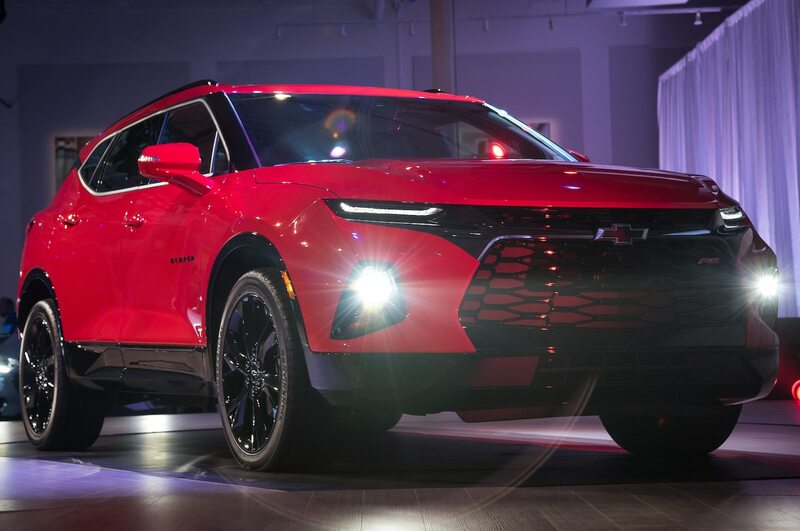 We’d like to see this feature offered at a lower price point, but in fairness, the Chevrolet does have a few standard features that cost extra on some competitors, including HID headlights and an 8.0-inch touchscreen with Apple CarPlay and Android Auto. 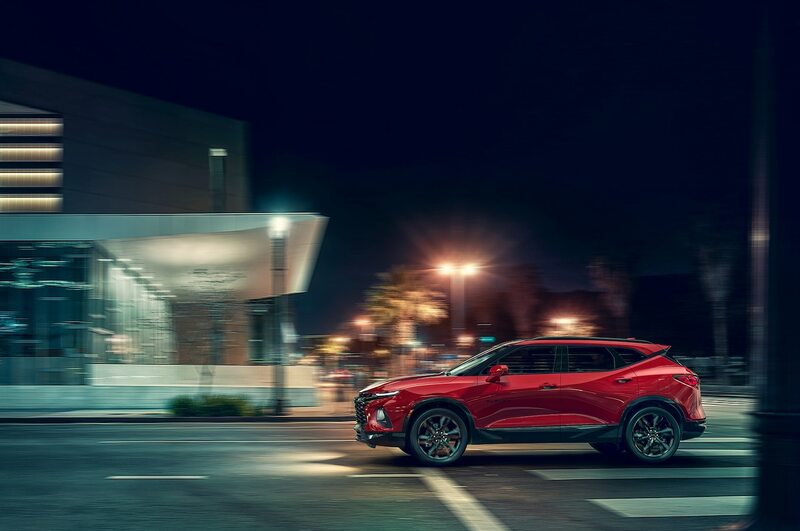 With the 2019 Blazer, it really comes down to the styling. 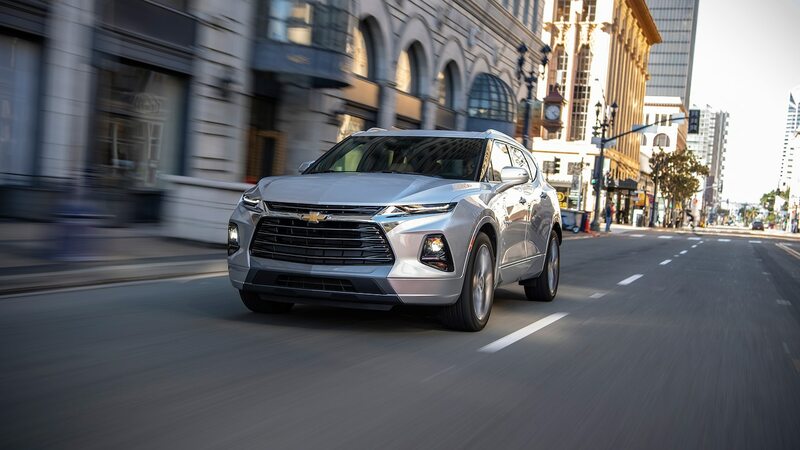 A few competitors match or beat the Chevrolet’s perceived spaciousness while surpassing its class-trailing cargo space (though you might not know it by looking at the Blazer’s cargo area). 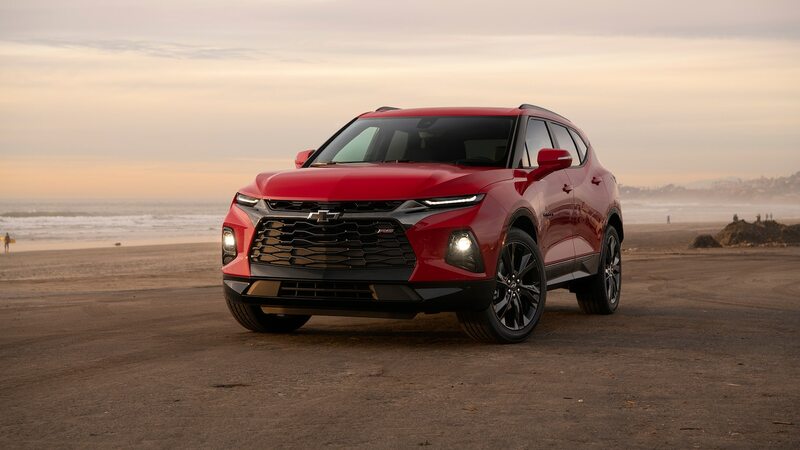 Some rivals also offer more features for the money at the higher end of the segment—good for those who value toys ahead of being able to say their midsize crossover has 300-plus horsepower. 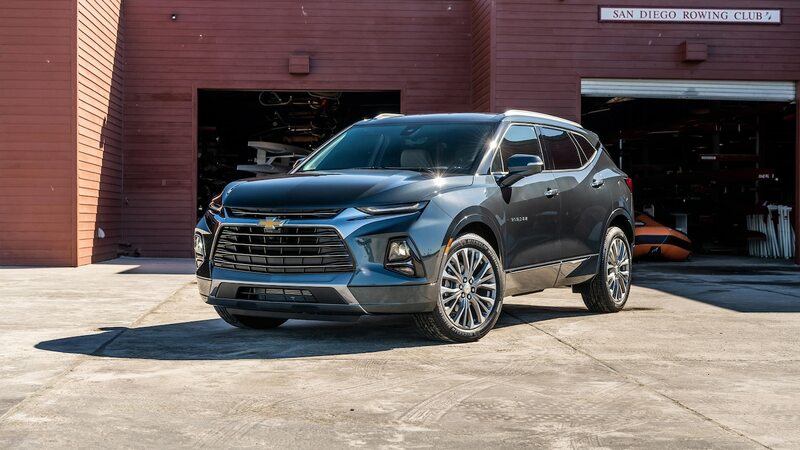 If you’d rather overlook the more subtle Equinox 2.0T despite that model’s incentives, the 2019 Blazer is a solid choice when you’re not expecting Passport-levels of space. 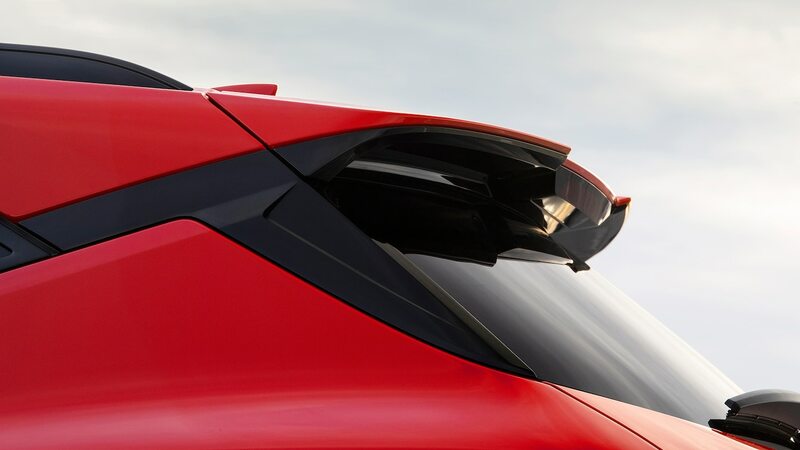 The engine stop/start system can’t be disabled, so it’s a good thing the system on both engines isn’t too noticeable when leaving a stoplight. 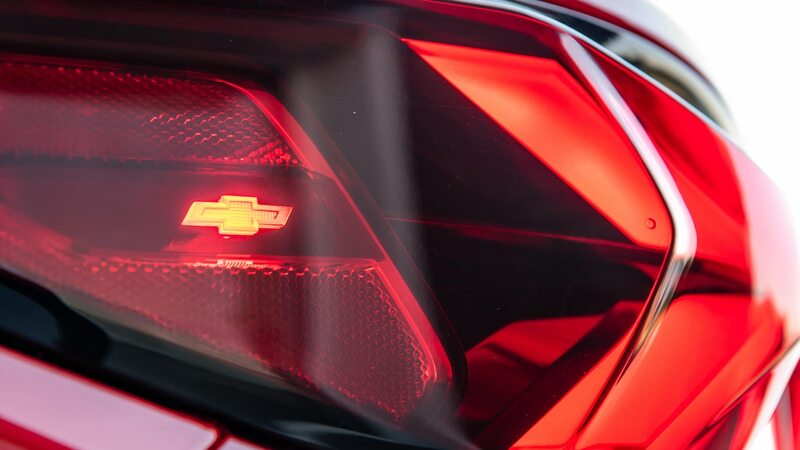 However, when the system reengages in the V-6 and you’re still at a stop, you’ll definitely notice the engine turning back on.